Known for his quirky commentary, the former hockey player and coach, Donald Stewart Cherry was born on February 5, 1934, in Kingston, Ontario to Maude and Delmar Cherry. In 1954 he was recruited by and started playing professional hockey for a minor league, Hershey Bears. He played with them for over sixteen seasons. In 1955, Don Cherry was honored by being asked to play in the National Hockey League, by the Boston Bruins in the match against Montreal Canadiens in the Stanley Cup finals. Unfortunately, because of an injury, he couldn’t make it to the National Hockey League for more than one game, despite his vast experience as a hockey player. Eventually in 1969, he decided to retire as a professional player after playing nineteen games with the Rochester Americans in the American Hockey League. After quitting hockey, he tried his hand at being a car salesman and was briefly involved in the construction business. During this, he also got a job as a painter. However, he soon returned to the field in 1971 as a player, for Rochester Americans. He made his transition from being a player to a coach, in 1972, when he was made the head coach of Rochester American and even won himself the title of, “Coach of the Year”. He also became the General Manager and was also proclaimed American Hockey League’s “Coach of the Year” in his third season. In 1974, after spending three years with Rochester, Cherry was shifted to the Boston Bruins as their head coach. He quickly became notorious for encouraging his players to engage in physical play in the field. Cherry has reported to say that he fashioned the way his players were made to play, after his aggressive bull terrier. Under Cherry’s guidance, the team finished first place, four times between the periods of 1975 to 1979. He was also awarded with the “Jack Adams Award” as National Hockey League’s top coach. Following the departure of players like Bobby Orr and Phil Esposito from the team, Cherry had to remodel his strategies. Unfortunately in 1979, in the match against Canadiens, after committing a coaching mistake on his part, Cherry decided to leave the team. His decision was partly influenced by the fact that he wasn’t getting along with Harry Sinden, the team’s general manager. After his time with Boston Bruins, he spent one season coaching the Colorado Rockies, however by 1980; he was done with his career as a coach. 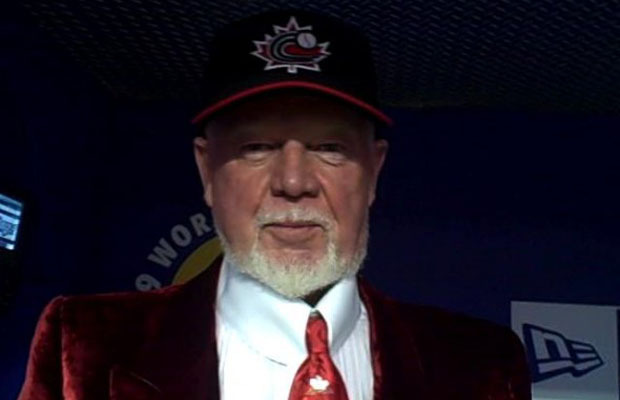 In 1998, along with three other investors, DonCherry set up the Mississauga Icedogs in the Ontario Hockey League. After he quit playing and coaching, Cherry took up commentary, appearing on numerous radio and television shows and commercials. He has also released a number of hockey highlight videos and gained popularity by being a part of the series, “Coach’s Corner” in the Canadian Broadcasting Corporation’s ‘Hockey Night in Canada’ with Dave Hodge. He has also been hosting his own show, “Don Cherry’s Grapevine”. Alongside this, he is a famous commentator for live games, where the combination of his comic use of English Language and his urging players to fight whilst playing has made him one of the most entertaining commentators. He also possesses the habit to comment on players’ skill solely based on their nationality. All of this have attributed to him being an extremely controversial figure whereas his commentary style is concerned.